It’s been another busy few weeks of online learning in our homeschool. It seems that lately we’ve had the opportunity to review several online learning programs. Ben loves the computer (who doesn’t, right? ), so he has really enjoyed these programs. Today, I bring you K5 Learning, an online program designed for after-school or homeschool enrichment study. This is not an all-inclusive curriculum. It works primarily as an adjunct to your usual curriculum. For a child, like Ben, who really struggles with math, an approach like this is appreciated. I spend a lot of time looking for additional math help for him, and I don’t always want an entirely new curriculum. The program begins with a free assessment of your student’s ability in math and reading and then adapts to the results. I love that it doesn’t just automatically teach at a grade level, because Ben’s abilities vary a great deal. K5 Reading helps build reading skills, covering, phonics, sight words, vocabulary and reading comprehension. 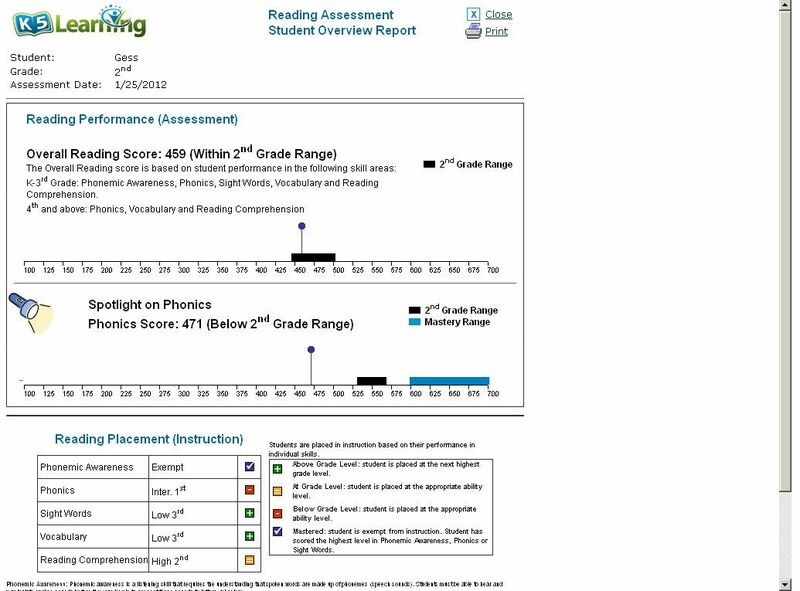 Ben (grade 5) tested above the teaching level of this program in all areas, so we didn’t use it much. But if you have a beginning or struggling reader, you will find it useful, based on our experience with the rest of the program. 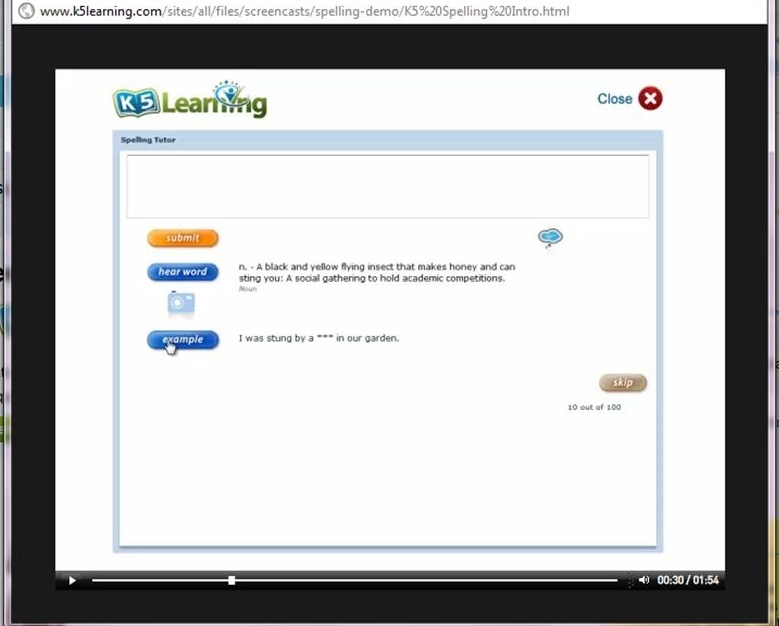 K5 Spelling is a vocabulary and spelling program with a 150,000+ word database. Ben loves words, so he enjoyed using this program daily. Words are generated based on your student’s reading level, past quizzes, and goals. Ben is natural speller and because he tested far above the 5th grade reading level, I wasn’t sure the vocabulary would challenge him. I had him use the vocabulary mode, in which he had to guess a word from it’s definition before spelling it. In the beginning, it was fairly easy for him, but as the program adapted to his abilities, it became quite challenging. This was his favorite part of K5. His only complaint was that there were many times he had trouble with the computerized “voice”, words were sometimes difficult to distinguish. K5 Math has a goal of building self confidence and a deep understanding of math concepts. 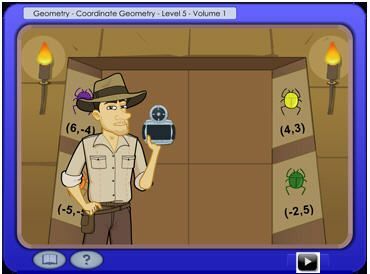 It covers numbers and operations, geometry, measurement, algebraic thinking and data analysis, using real world scenarios, rather than just boring math problems. I found the assessment too very enlightening and helpful. I knew that Ben struggles with some basic math concepts, but through the K5 assessmet tool, I discovered he was woefully delayed in some areas, while excelling in others. Having the assessment made sure that Ben was given math instruction at whatever level he was working (between grades 2-5 for him), because the program adapts according to skill. So if your student is like Ben and working at a 3rd grade level in measurements, but a 5th grade level in operations, this program adapts to that. It’s ingenious really. 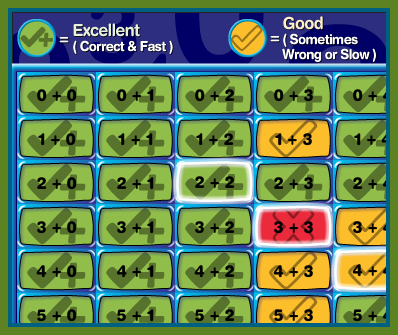 K5 Math Facts uses adaptive technology to help kids develop instant recall of basic addition, subtraction, multiplication and division facts. Students work every math fact until it’s mastered. For this area alone, K5 is worth the monthly fee. The adaptive technology is key here. As much as Ben would like to move on to another fact, it will not allow that until he has mastered the fact he’s on. It also does not force him to continue with facts he has mastered. That’s a huge thing with Ben. Once he has mastered something, it frustrates him to no end to have to continue doing it.This was my favorite part of K5, even if it wasn’t Ben’s. View a math fact demo. You can check out K5 Learning for free using their 14-Day trial. During this trial, you will be able to use the assessment tools and have full access to the entire program. Unlike some online programs, you do not have to give a credit card number to use the free trial. You can view their introduction video here. You can view additional sample lessons here. We plan to continue using K5 Learning past the 6 weeks we were given for doing this review. I believe both the Math Facts and Spelling programs to be worth the monthly fee for us. I have been searching for a program that really drills math facts to mastery and K5 Learning does just that. Ben really enjoys the approach to spelling and vocabulary as well. Even though I don’t have concerns for Ben in this area, I believe it will keep him working on the Math Facts to have the Spelling part to look forward to. I’m grateful to have been introduced to K5 Learning. Other members of the TOS Crew have been using K5 Learning as well. You can read what they thought here. Disclaimer: As a member of the TOS Crew, I received this product, at no cost to me, in exchange for my honest review. All opinions are those of myself and/or my son.